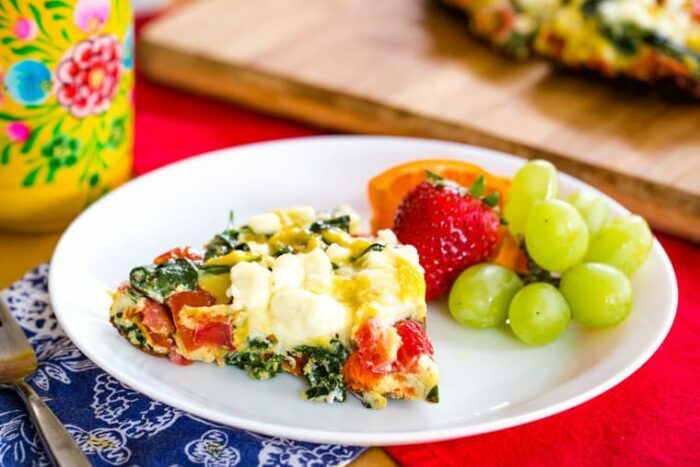 Spinach frittata with cherry tomatoes and feta cheese is a quick and easy meal for busy days. 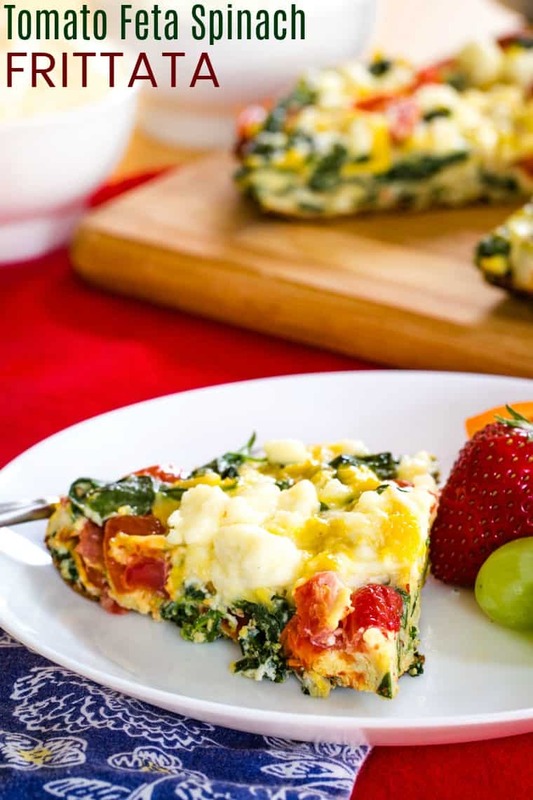 This egg frittata recipe makes a high protein, healthy breakfast. 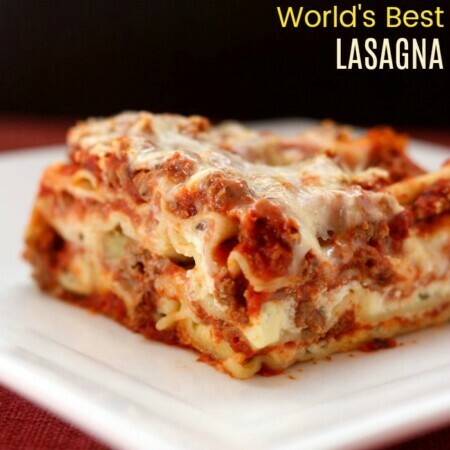 It’s gluten-free, low carb, meatless, and is kid-friendly, too! 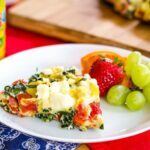 And when you round it out with some fruit or sausage or toast, Tomato Feta Spinach Frittata is also one of the best gluten free brunch recipes for holidays like Easter or Mother’s Day, or a fast brinner for busy nights. We all have them. You know what they are. So I had this sudden realization on Sunday, the day I hit 37 weeks, that Baby Brother is going to be here… SOON! Normally on Sundays, we lazily have breakfast, then at least make an attempt to go to church. When we get home, I do some stuff on the computer or a few random chores during The Bug’s afternoon nap, and I still manage to pull together a decent dinner. Mom was visiting and was happy to go off galavanting with The Bug in tow. The Hubby had some work to do to prepare for a meeting on Monday. So, I felt it was time to begin to tackle the random piles of baby stuff everywhere. I finished the laundry I had started, folded the piles of bibs and blankets that I had stacked in the crib, took covers off of the swing and bouncer seat, and washed those and some other random things I found, wiped random things down with alcohol to clean them, rummaged through bottles and breastfeeding supplies to see what could be put back into service, and started gathering a few things for my hospital bag. Needless to say, I was exhausted and was not looking to make dinner a huge ordeal. The very first thing that came to mind was a spinach frittata. 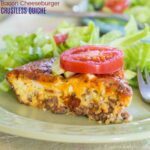 A frittata is baked eggs, sort of a combination of quiche, like this Bacon Cheddar Quiche, and an omelet, but it isn’t folded. 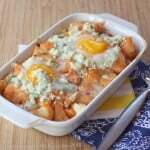 You start cooking the eggs in a skillet on the stove top, then finish it off in the oven. 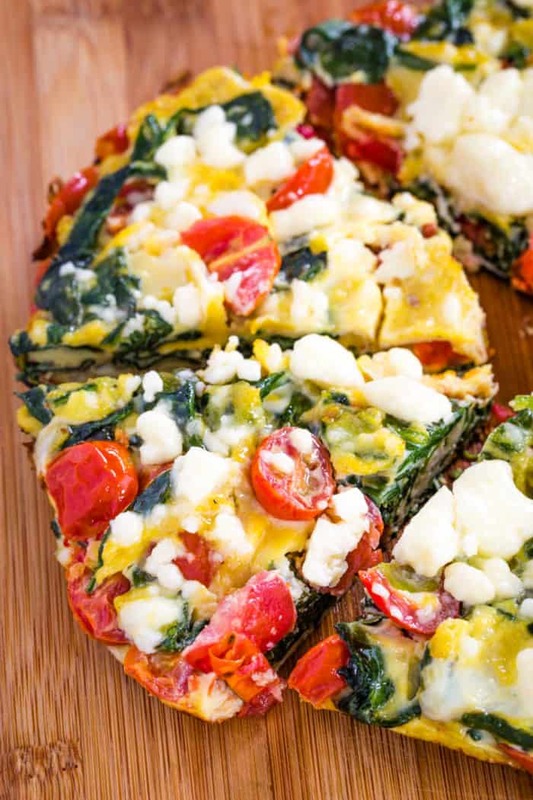 So this Tomato Feta Spinach Frittata is one of my, what I like to call, “back pocket meals”. 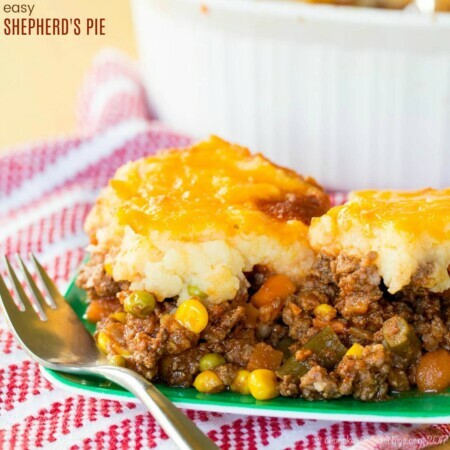 Typically I either have the ingredients on hand or only need to quickly pick up one or two things. It comes together quickly, I don’t have to look at a recipe, and all three of us enjoy it. Well, my big guy usually insists I pick out the tomatoes, but scrambling spinach into eggs is pretty much the only way I can get him to eat leafy greens. So I’ll take that. A little bit of Waldorf Fruit Salad or even just an orange, maybe a little turkey sausage, some toast or English muffins, or some combination of those, and we are good to go. 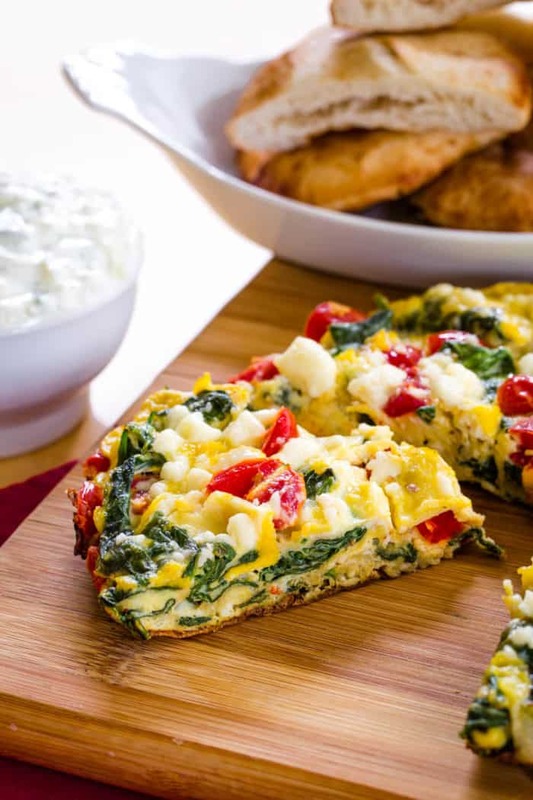 Frittatas are really versatile. 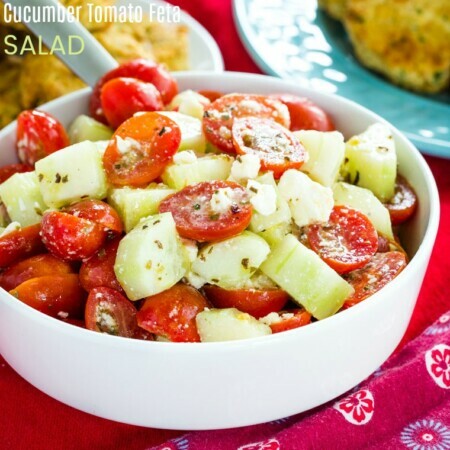 Just use whatever veggies or cooked meat you have on hand. Spinach frittata is what my pregnant body was craving. Eggs are a go-to for me for a back pocket meal. They are so quick, easy, and versatile. Plus you can make the portable if you take this combination of ingredients or any of the other ideas you’ll find to make 20 of the Best Egg Muffins. 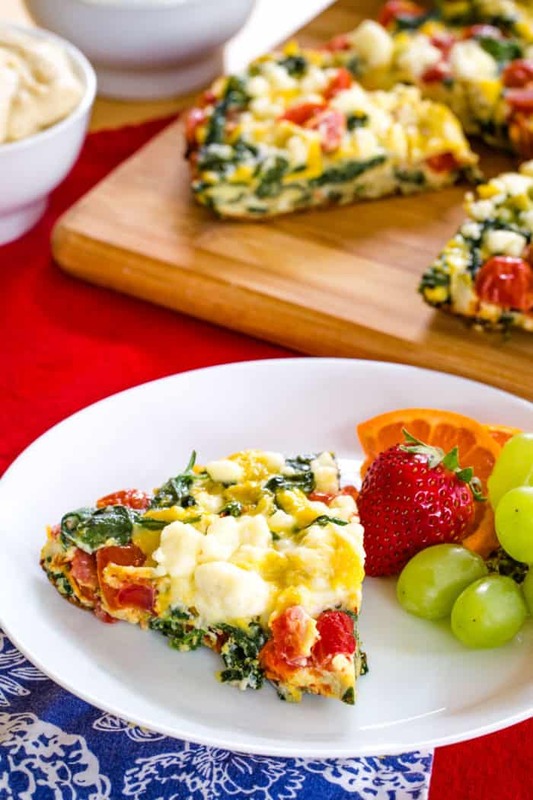 If you like the spinach frittata recipe, here are more ways to use eggs to create quick and easy dinners. What kind of pan is best for making a frittata? A good nonstick skillet is definitely a worthwhile investment. 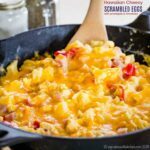 This Le Creuset Skillet is a great option, and though it’s a little pricy, the features will make this a kitchen workhorse that stands up over time. With a pan like this, you can leave out any excess fat, which often, especially in a nonstick pan, doesn’t help keep a recipe like this frittata from sticking. And it’s safe to put in an oven up to 500°F and even under the broiler. Whisk the eggs, 1/2 tsp salt, and pepper in a bowl. 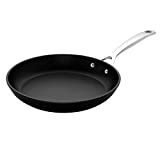 Preheat a 9-10 inch nonstick skillet over medium heat and spray with olive oil or cooking spray. Add the spinach and the remaining 1/2 tsp salt, and cook 3-4 minutes, or until the spinach wilts. Add the tomatoes and eggs, and stir gently with a rubber spatula. Continue to cook over medium heat until set slightly, 5-6 minutes, stirring and scraping the bottom of the pan with the spatula every minute or two. 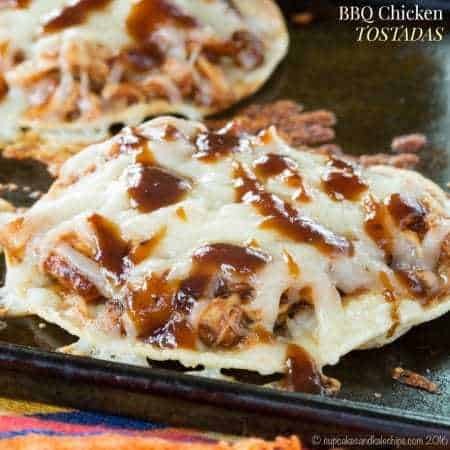 Scatter the cheese over the top, cover, and cook for 6-7 minutes. Once the eggs are nearly cooked through, place under the broiler for 3-4 minutes, or until the eggs are fully set and the top has browned. Use a spatula to loosen the frittata from the pan, and slide out onto a cutting board or plate in order to slice and serve. First time making one and it turned out great! Thank you so much. The days are slow, but the weeks are fast! Yes, we all have those days & your back pocket dish looks fantastic. And when we do, it is good to have easy meals to fall back on!